Posted in Barack Obama, Ben Carson, Bernie Sanders, Chris Christie, Democrats, Donald Trump, Hillary Clinton, John Kerry, Martin O'Malley, Mike Huckabee, Politics, Polls, Republicans. Tags: Ben Carson, Bernie Sanders, Chris Christie, Donald Trump, Hillary Clinton, Howard Dean, John Kerry, Martin O'Malley, Mike Huckabee, Politics, Polls. RSS feed for comments on this post.. TrackBack URL. PLEASE fix this. As a 40+ year resident of the State of Hawaii, I know for a fsct that there is NO WAY my State will vote Red/Republican/Conservative, we are possibly the most liberal/Democratic State in the Country. There is nothing to fix. 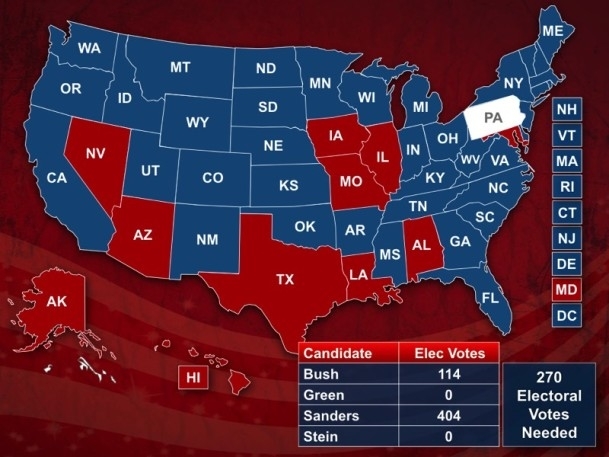 This is how the mock election came out–and why I am so skeptical about it. Polls are snapshots and are not predictive; they’re descriptive. It’s just that the description of voter sentiment the day before the election, for instance, is closer in time to the casting of ballots. Also, because polls reflect verbal behavior and ballot-casting is an act, polls should be taken with a grain or several of salt. Finally, all this ignores whether the poll is based on a scientific random sample, how the universe is defined, and the margin of error (which is appropriate only for scientific samples). X Hays, See the comments on the polls here (50% open to change) along with the post I linked to. Among the key facts, in December 2007 the polls were talking about Clinton’s lead growing over Obama. In December 2003 the polls had Kerry in 6th place, trailing Al Sharpton. No matter how good the poll is, national polls are virtually meaningless prior to the vote in Iowa. Even polls in Iowa and New Hampshire mean little as a huge number of people don’t decide until the last minute.